Travelling between different time zones and that too in the easterly direction is no laughing matter for me. My body wants to sleep when the rest of this part of the world is up and about and lacks sleep when they are resting. In medical terms its known as desynchronosis but more commonly its called jet lag. Travelling from Montreal to London and then to Mombasa, the body is pretty confused. Last time it took several days before my routine came back. It appears that the same is going to happen again. The cooler rainy weather doesn’t help as I just want to curl up and go to sleep. Well at the moment I am up so thought I should pay a bit of attention to my blog (I do get the blogging itch if I haven’t been able to blog for a few days:) ). Just on the day I was leaving Montreal, I was sort of arranging and clearing the fridge and pantry for my bachelor son, when I came across a whole jar of sweet cashew nuts. I had taken them for him during my last trip. Thank God the cold weather managed to keep them still fresh and crunchy. A few days ago my son had asked if I could make kaju barfi for him. I didn’t manage and was feeling sad that I hadn’t fulfilled his request. My supporting hubby asked if it would take long to make and I replied “not really”. “So then make it fata faat”, he said. Immediately got busy grinding the cashew nuts and making the syrup. I opted for the simple recipe of grinding the roasted cashew nuts and adding it to the water sugar syrup. The reason being that if my son does not finish the barfi in a few days, it will still stay good for a while because of no milk or milk powder, cream or mawa (khoya). Instead of patting it down into a tray to let it set and then cut into squares, I simply rolled the barfi into a log shape and cut it into slices. I didn’t want to leave the task of taking out each square carefully from the tray to my son. So here is the quick kaju barfi recipe. What we call barfi in the sub continent is fudge in the western world. Grind the cashew nuts into a fine powder in a food processor. Add the cardamom and saffron powder and mix well. Put the sugar and water in a pan over medium heat and bring it to a boil stirring it to dissolve the sugar. When it begins to boil, lower the heat and let it simmer for 5 to 6 minutes till you get a one string consistency. Put a small blob of the syrup on a saucer or small plate. Let it cool a bit. Take a bit of the syrup with your finger and press it to the thumb and open it. You will see a single string will have formed. The syrup is ready. Add the cashew nut powder and stir over low heat till it becomes stiff. Remove the cashew nut dough from the pan and put it on the clean work top. Grease your hands. Knead the dough till it becomes smooth. Roll it into a log shape. Size depends on you. By now the log will have become cool. Slice it and store in an airtight container. Add saffron strands to the syrup if you like. The barfi will get a slight lemony yellow colour. If you like, pat the mixture into a greased tray and let it cool. Cut into squares and remove carefully. Use white sugar for a clear clean syrup. Do not use cashew nuts just out of the fridge. Roast them lightly before grinding to avoid the powder from becoming oily and lumpy. 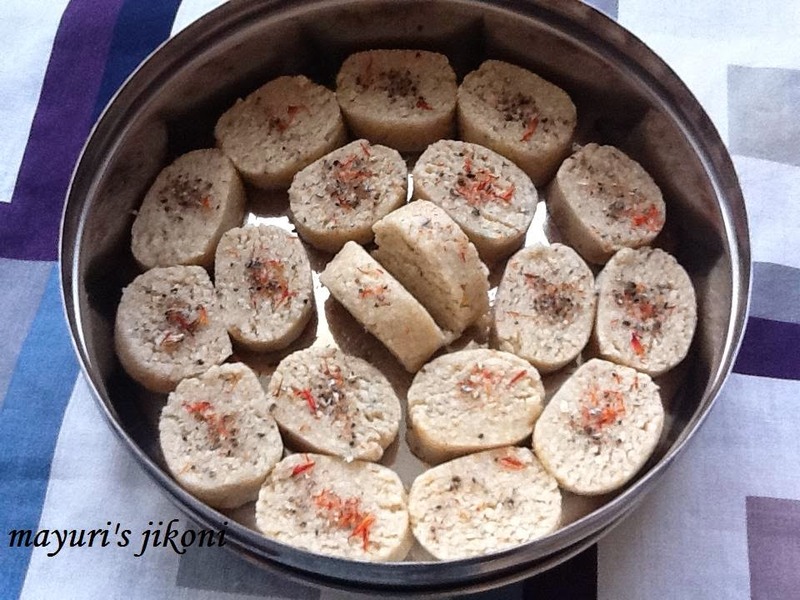 oh my very favourite .Looks so yummy indeed.Thanks for linking it to favourite recipes event .